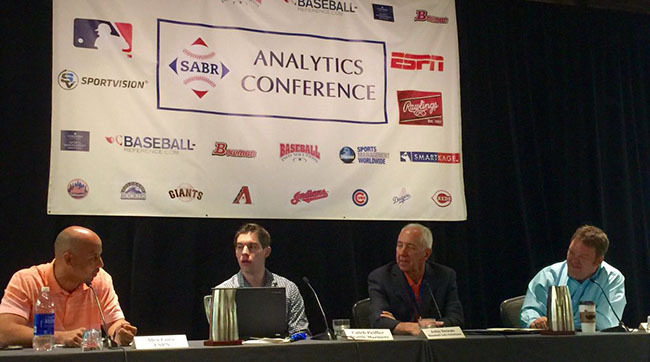 The 5th Annual SABR Analytics Conference concluded on Saturday with another fantastic day filled with research presentations, panels, and enough stats to make your head spin. You may remember that on the first day of the conference, Aaron Boone, Dallas Braden, Eno Sarris, and Mike Ferrin discussed the analytics behind pitching and hitting. On the last day, a panel discussed the analytics behind the other aspect of the on-the-field game: defense. The Defensive Metrics Panel was moderated by Ferrin and included ESPN analyst, former pro, and 2007 World Series Champion Alex Cora, Baseball Info Solutions (BIS) owner John Dewan, and Mariners Manager of Baseball Operations Caleb Peiffer. The group discussed a range (pun intended!) of aspects regarding how analytics affect the defensive side of the game. But an area they spent serious time on was how more and more players are beginning to look at their defensive analytics so they can improve more parts of the game. One specific player discussed was Seattle Mariners catcher Chris Iannetta. When Iannetta was on the Los Angeles Angels of Anaheim, he looked at his pitch framing rank among all MLB catchers and was upset to see that he was in dead last. He approached the team and told them that he wanted to improve this number. "They showed him a lot of video of the players who were the best framers, and worked with the coaching staff, and had him try to emulate some of those guys," Pfeiffer said. "And it worked. He turned from one of the worst framers in the game two years ago to among the top 10 or in that range last year. I think that’s a testament to defensive analytics and what they can do for a player if he actually buys in." Dewan said that in a fantasy league, he had actually picked Ianetta as his one player who he would get more points for the worse he performed according to analytics. (In other words, if Iannetta's WAR was -22, Dewan would get 22 points). Dewan was shocked to see at the end of the season how much Iannetta had turned his numbers around. ​Another point the three panelists discussed was tracking defensive shifts. Teams use shifts in different ways based on the ability of their players. So, the panelists said, they would like to see more analytics geared toward the tactic in the future, however that might be portrayed. - A panel moderated by Dan Migala of PCG/SportsDesk Media featuring the Diamondbacks' John Fisher and the Padres' Ryan Gustafson: These three discussed how big data and analytics are impacting baseball's business operations. They also taught the crowd different terms that those who work in business operations consider their vernacular, much like how many of those in attendance consider WAR, BABIP, and wOBA part of their vocabulary. - Another panel on business operations moderated by SABR President Vince Gennaro featuring the Padres' Nick Ennis, the Orioles' Sarah Gelles, and the Giants' Yeshayah Goldfarb: They discussed how they assist the general manager in signings, and the difference between having a homegrown team vs. a team built off of free agent signings and trades. 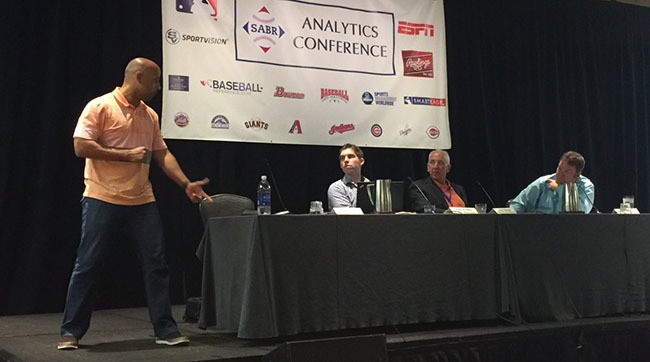 The 2016 SABR Analytics Conference was a lot of fun — and a huge success. I can’t wait to see what’s in store for the 2017 event, which will take place in Phoenix March 9-11.